When I was planning this voyage and thinking about the route, I also considered going the safer easier way through the canals of France. I had a lot of respect for the Bay of Biscay and also the Portuguese Atlantic coast which is said to be more dangerous than the Biscay. Many harbours at the Portuguese Atlantic coast are built at river estuaries and can be very dangerous in some situations because of the bars and the resulting breaking waves at the entrances. It is said that one yacht minimum gets lost every year at this coasts. Nevertheless, now after I have completed the voyage, I am glad I took the Atlantic route. Those parts I had most concerns about, turned out to be the best ones. 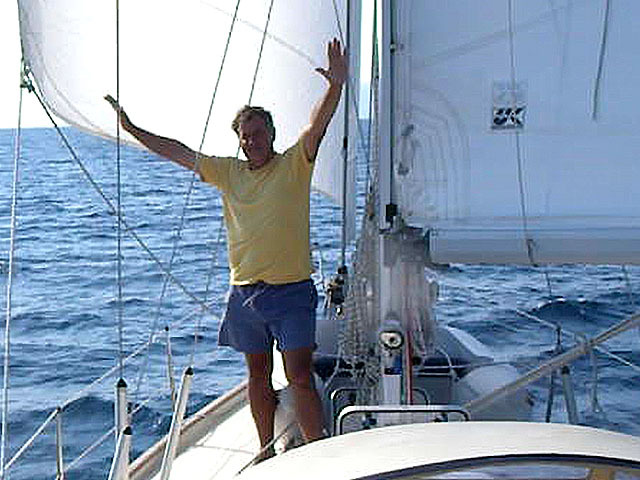 The Biscay was a great experience; first time Atlantic waves and the feeling of real blue water sailing. The weather can change quickly in this part of the world and it often blows at F7 or more off the Spanish north-west coast. You have to be prepared for everything and arriving after three to four days also means satisfaction and relief. I clearly remember Patrick shouting out “Land in sight!”. The Portuguese coast was downwind sailing first class. It was great fun watching Matilda surfing down the Atlantic waves steered by the autopilot. 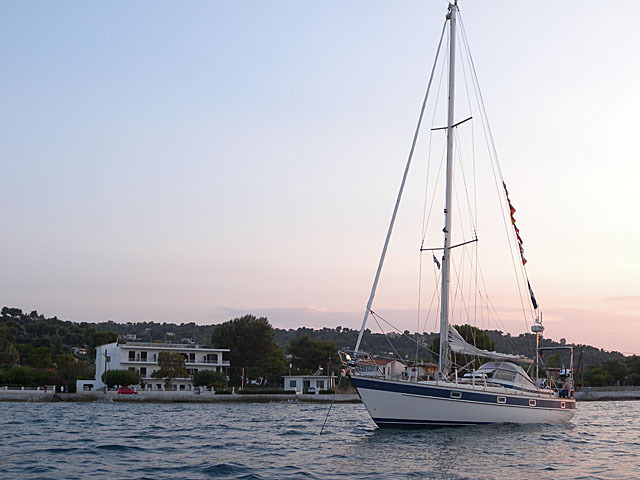 A long(ish) keel yacht sails quite well in such situations but you have to pay for that with the stress you get when maneuvering in tight harbours. I must admit that the weather was nice to us on those two legs and we were not faced with severe conditions. At least nothing I had not been prepared for or had not expected. The first Leg was not as nice. The plan had been to sail along the south English coast (enjoying some nice pints in British pubs of course) and then cross the channel to Brest. Unfortunately, the wind has been blowing hard and almost always from west for the 2 whole weeks of that leg and it was stronger in the north side of the channel. Therefore, we followed the French coast. We had some very unpleasant and wet passages which have not really been funny for every crew member. Lisbon – Gibraltar was the most diversified leg. Atlantic waves surfing, then strong winds and big waves around Cabo de Sao Vincente, the calm and almost Mediterranean Algarve and then F6 against on the way from Barbate to Gibraltar. 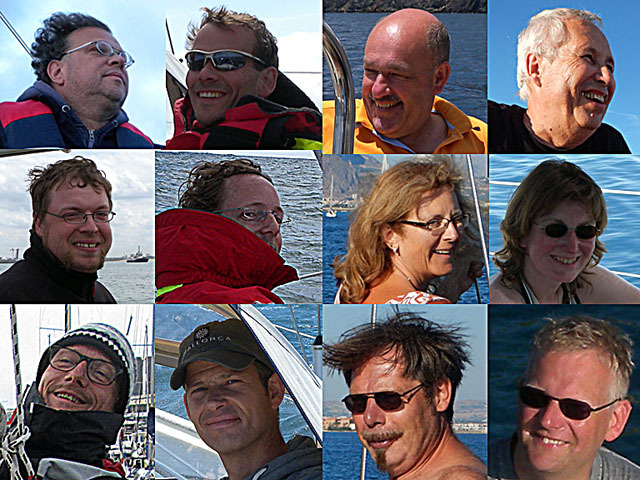 Most of the passages in the Mediterranean beginning from Almerimar and going east have been hot and windless. 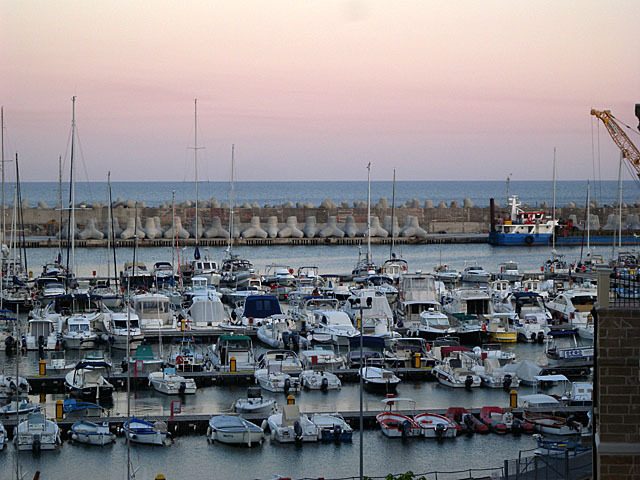 Many places especially in Sicily were overcrowded, expensive and offering bad service. 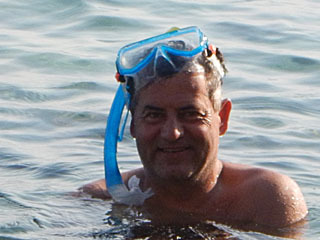 Greece on the other hand, was a highlight (yes, I am 50% Greek, but this statement is also at least 50% unbiased  ). 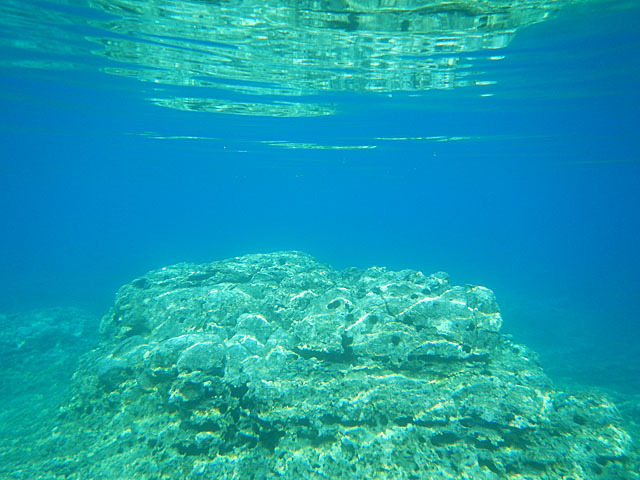 Very nice scenery and great anchorages and waters so clear that you think you would ground the boat although the depth was 10 meters. Top food quality at relatively low prices in several tavernas, where almost everyone spoke good English (I can’t really say that about Spain or Italy…). There was one English long distance sailor in the Baleares who I asked whether he was sailing to Greece too and he answered: “No, not yet. I will visit some other places first because if I go to Greece now I will stay there”. 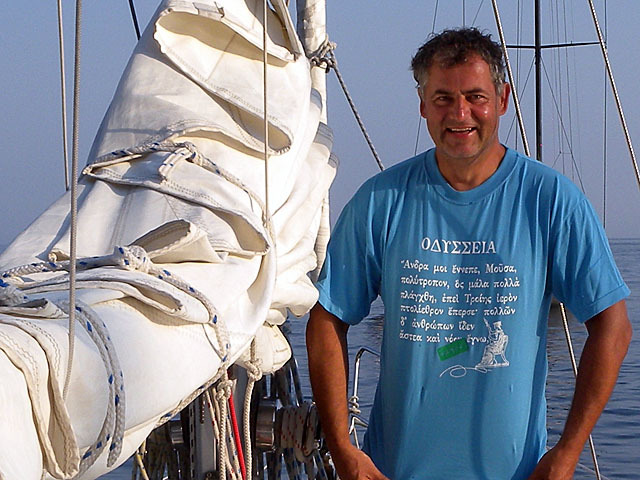 The last leg in Greece was singlehanded sailing and that was new to me. The first day I felt a bit insecure but soon I got used to it. 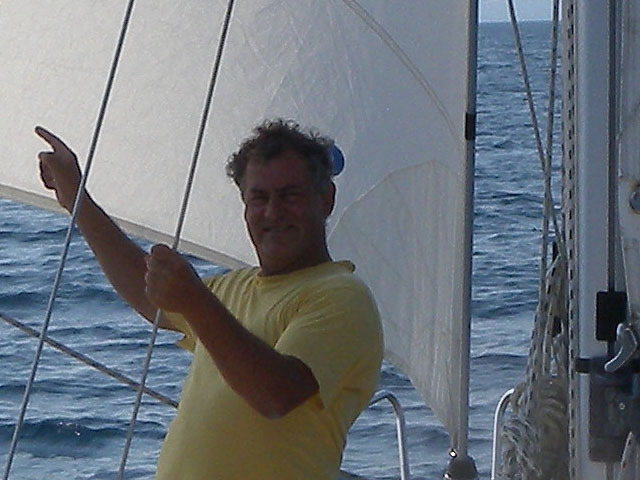 Boat handling at sea is not an issue and sailing alone is a nice experience; everything is more intense. 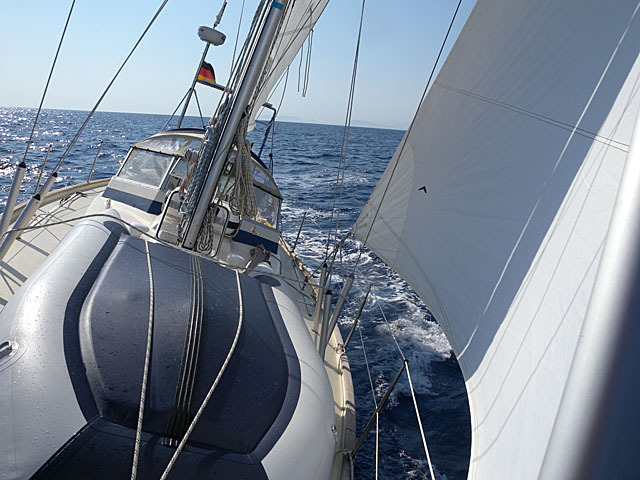 There are some issues though: You can’t just go down and have a nap when you feel tired and coming into a harbour is always connected with the question of whether you will be able to find a place that you can manage to get in and out singlehanded. You are also more dependent on some electronics like the autopilot and you have to make sure that you don’t go overboard underway because the chance is quite high that it could be your last time! At the end of this résumé I don’t want to miss out saying a big thank you to all of the crew members that have accompanied me and Matilda on our voyage. It was great having you on board. You definitely helped making my dream come true. THANK YOU! “There are two bad things in a man’s life: Not to be able to fulfill his childhood dream …or to have done it”. 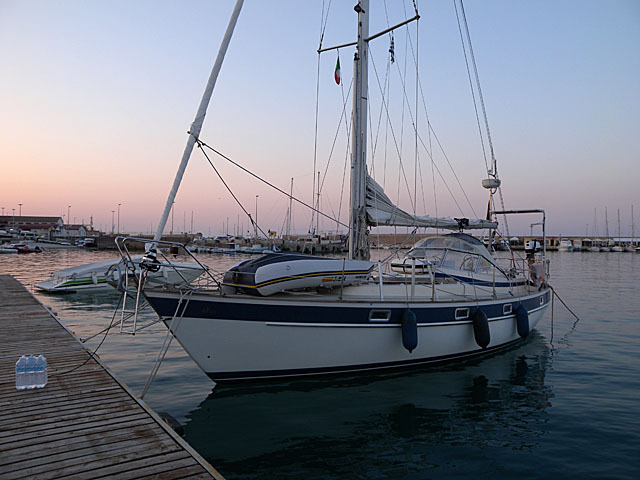 I can’t remember who said that but there is some truth in this statement and for me it means that I need a new dream now… Sailing south through Suez to the Maledives, Reunion and Madagascar, or Oropos – Gibraltar – Canary Islands and back? Or maybe over the Atlantic to the Caribbean with the ARC? There are many interesting options and I will have some time to think about it. For the time being and the following few years, Matilda will be located here for various reasons. There are also some things that need to be done on her like the rudder bearing, the portholes as well as the removal of many layers of old antifouling and the application of Gelshield. I also want to check the complete cabling and upgrade/redo where needed. 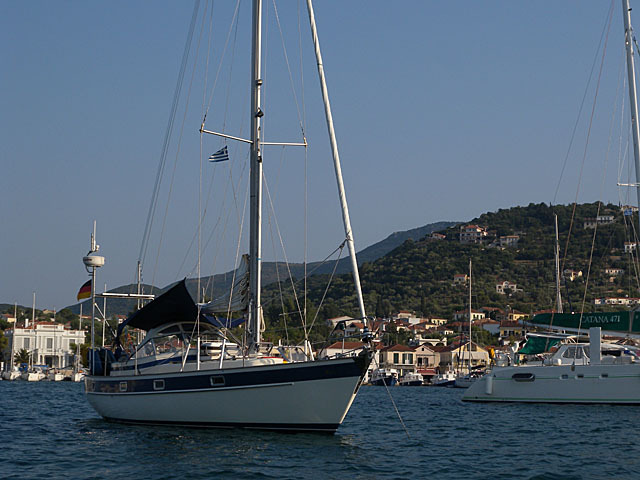 During this time Matilda will sail the Greek waters and visit the hundreds of islands and anchorages in this area. Thank you all for reading the blog! P.S. I will try to compile some videos of the voyage (one for every leg). So, if anyone is interested, she/he will find the link in this blog as soon as they are completed. It’s done. On May the 3rd 2015, a cold wet day, in the morning at 06:00 I left the Oosterschelde, sailed to Belgium and France and through the Alderney Race to Guernsey. I crossed the Bay of Biscay, and rounded Cap Finistere. Pushed by the Portuguese trade winds I surfed the Atlantic waves along the Portuguese coast all the way south and around Cabo de Sao Vincente to Spain and Gibraltar and into the Mediterranean. 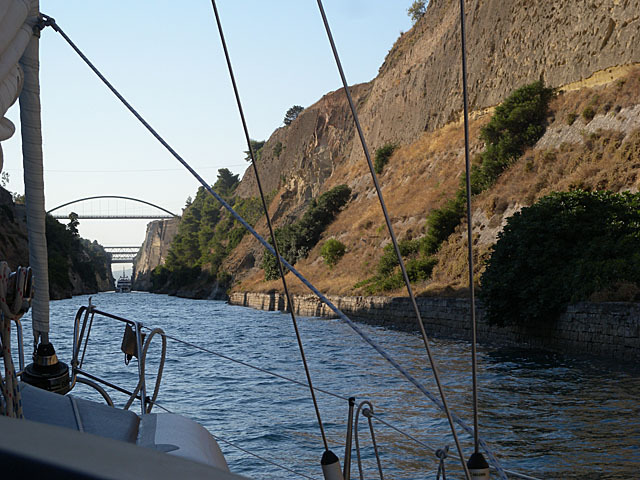 I anchored in the Baleares and sailed to Sardinia and Sicily and the Lipari Islands. 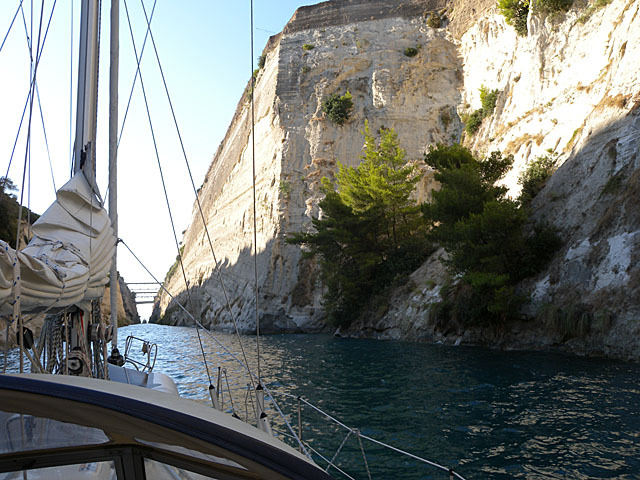 I dropped the anchor in fantastic bays in the Greek Ionian Islands and visited Odysseus’s home island Ithaca. 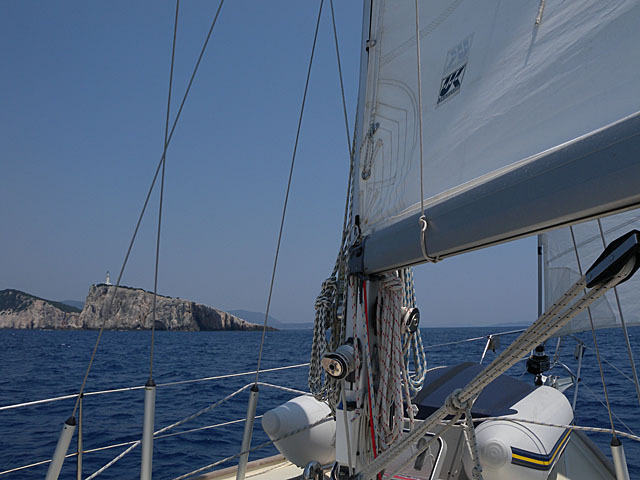 I sailed singlehanded from Corfu to Oropos where I finally dropped my anchor in the bay where I learned to sail when I was a child. 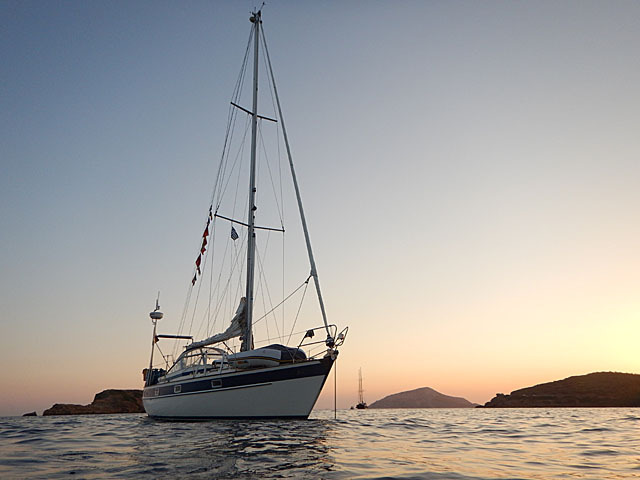 Tomorrow, Matilda will be sailed to Chalkoutsi where she is going to be located for the next years. 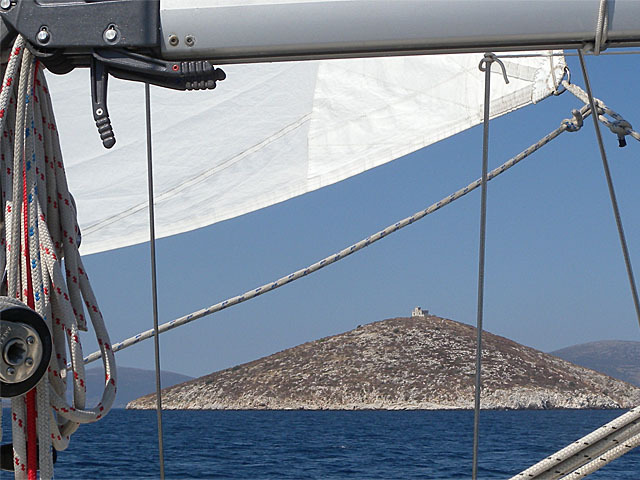 I am at anchor in a little bay just below the temple of Poseidon on Cap Sounion. The voyage is almost finished. I only have to round the cape and sail north for 10 -12 hours. Now I understand why Bernard Moitessier turned his boat a few days before the finish in the Golden Globe Race and sailed around the world a second time. And what about Odysseus? 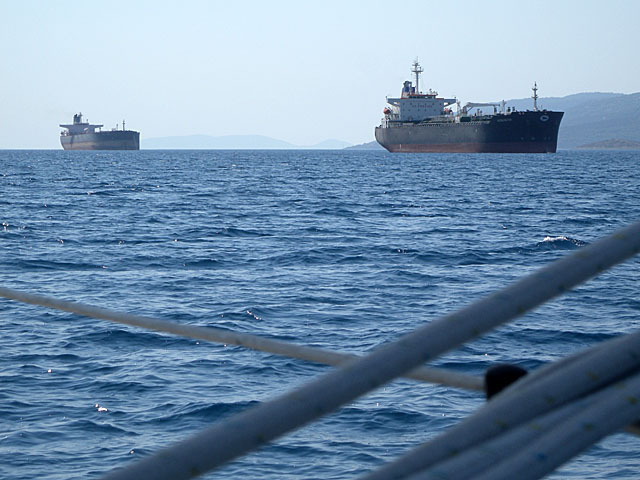 Can we believe that an experienced mariner needs 10 years to find his way home? This morning I left Korinthos marina at 07:30 local time and headed for the Corinth Channel; a nice and interesting passage. I was asked to pass at maximum speed following a convoy and I had to steer carefully but I managed to take some pictures. 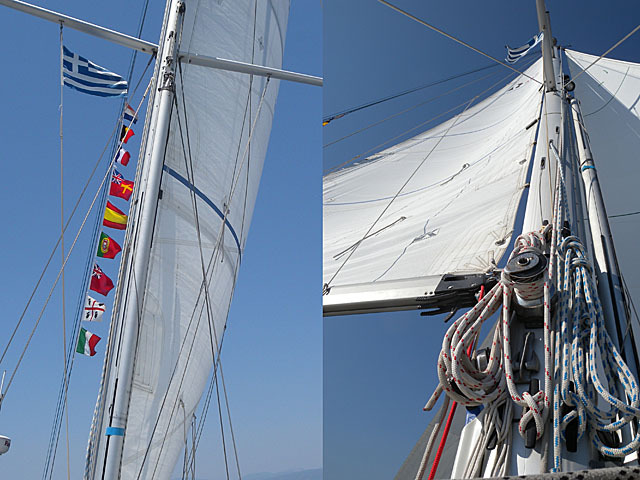 There was some wind on the other side in the Saronic golf and I hoisted the sails. After a few hours the wind dyed away. I rolled in the Genoa but left the main. I do this quite often because the main doesn’t shake like a flag when motoring and it is always ready to be used without any effort. 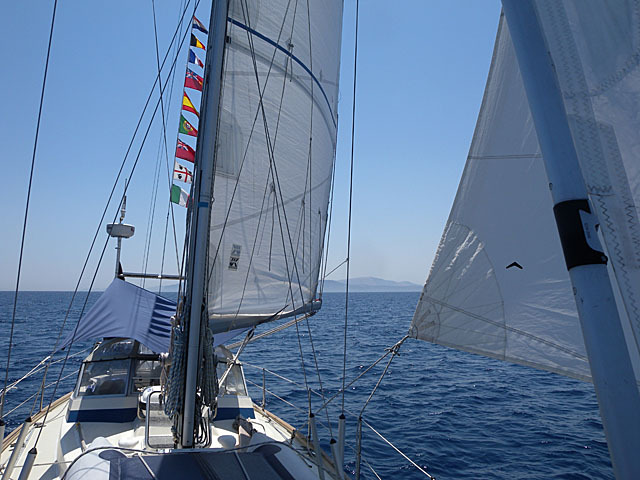 When I passed north of the island of Aegina the wind freshend up to F4 and sailing was possible again. 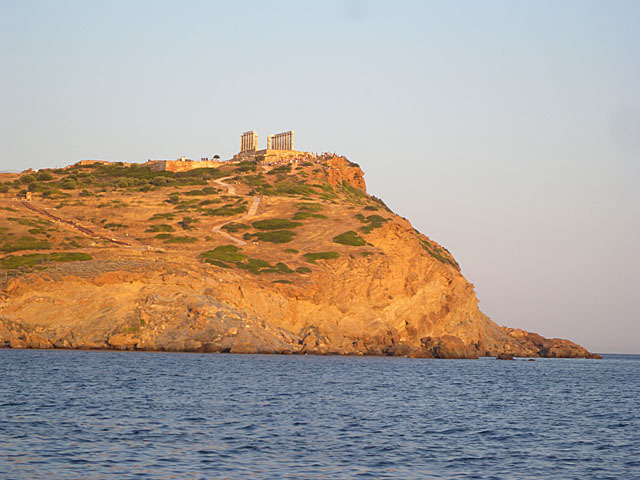 I arrived at Sounion at 20:30. 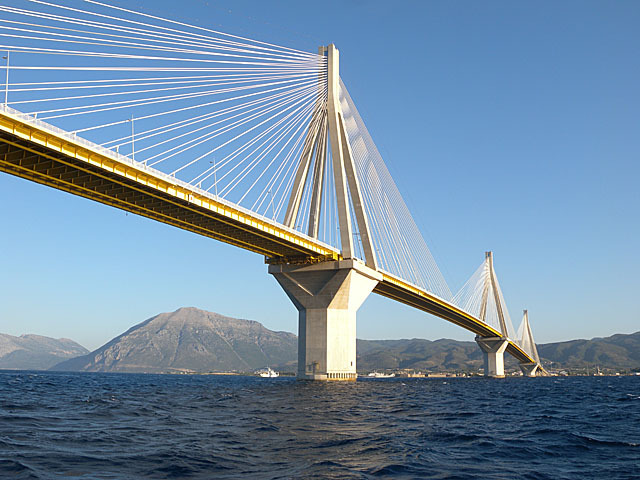 The trip from Patra to Korinthos on Tueasdy was also quite interesting with the passage under the Rio-Antirio Bridge. When I left Patras in the morning at 07:00 it was already blowing at F5 (against of course :-) ). Although 60° off course, I sailed a few hours at midday because I couldn’t hear that engine noise any more. 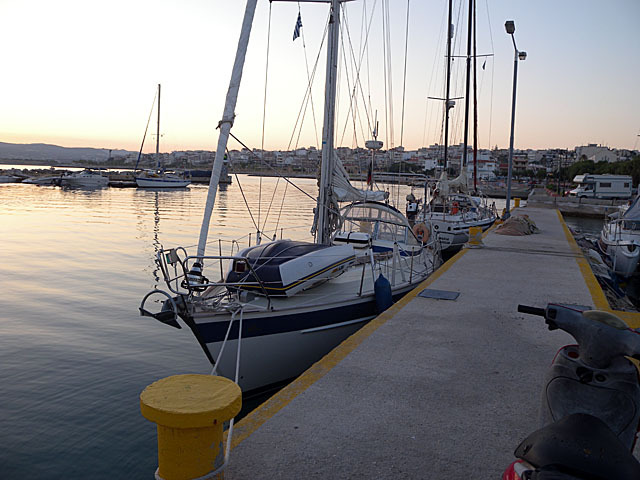 I managed to arrive at Korinthos marina at about 20:30 and the wind had died away completely. Just one hour ago and in lee of Oros Yeraneia is was gusting at F5 to F6. A friendly Austrian sailor saw me coming in and helped me with the lines. He had sailed extensively singlehanded in the past and knew the situation. He was sailing with family now and I was invited to a very tasty pasta bolognese. I contributed a bottle of wine to the dinner, which I had bought in Sicily some weeks ago. It’s always good to meet other cruisers and listen to their stories and often you learn something new. 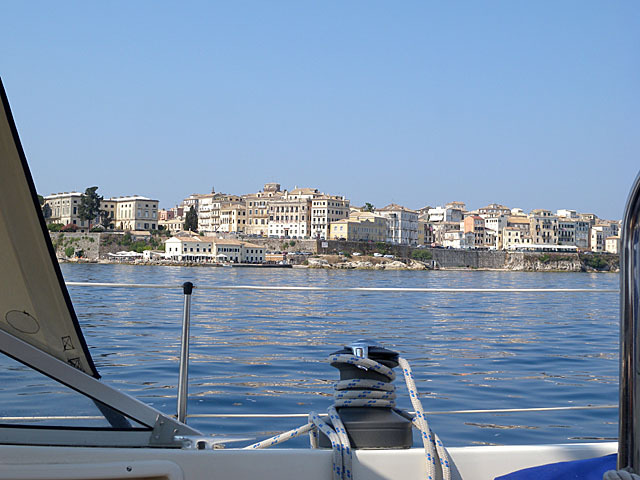 This time it was that I should use an external diesel filter when refueling in Greece because diesel contamination is not uncommon here and can lead to engine failure. Thanks Adi! There was some nice (and fast) sailing of course, but not as often as I would have wished. Since I wanted to keep to the time schedule I hade to use the engine a few times. The day started early with a dinghy trip to the bakery. A “real” bakery with an assortment I am used to in Greece. 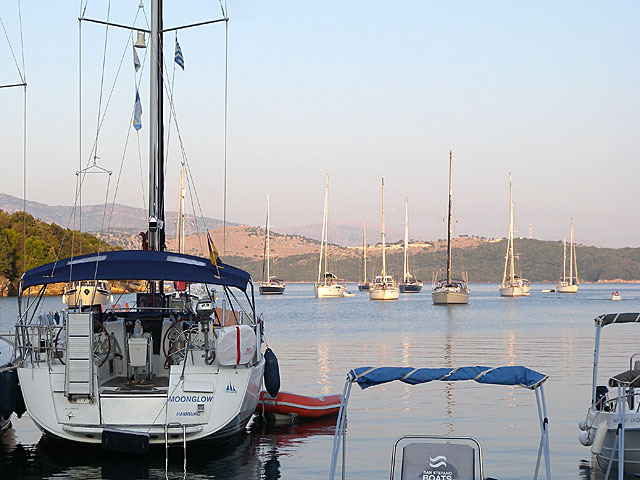 The anchor was lifted at 7:20 local time and after a stop for a refreshing bath at the entrance of the big bay Ormos Aetou I headed for the strait between Peloponnese and mainland-Greece. After entering Patraikos Kolpos the wind came back! A great sailing wind of 20+ knots was blowing, but guess from which direction? Little hint: I was heading east…. YES! Right! The wind was coming exactly from east. Together with a short, steep and choppy sea it was difficult to make way east and I had to motor-sail again. 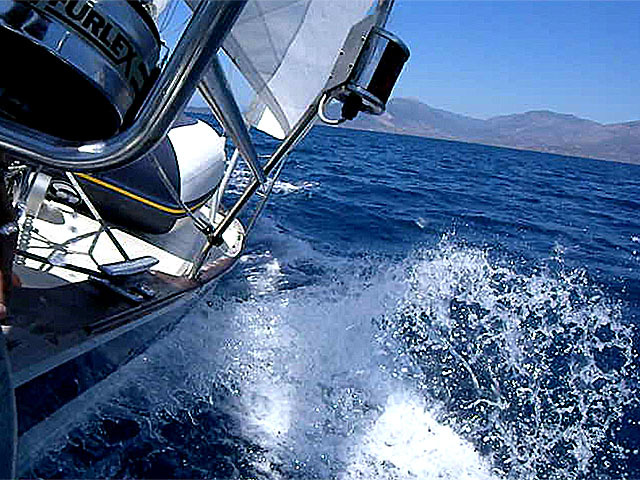 Sometimes, when bigger waves were stopping the boat, the speed OG was dropping below 3 knots. I couldn’t reach the harbour I had planned and decided to go into Patra instead. When I was entering the harbour it was still blowing at F5 gusting F6. I would normally have gone into the marina but with the stronger wind blowing and me sailing singlehanded, I decided to go into the commercial harbour and look for a more comfortable place. I found one behind two tug-boats and since someone wanted to help on the pier, it didn’t take long and I had secured the boat alongside the central pier. A few minutes later someone from the port authority appeared on a motorbike complaining that I entered the harbour without asking permission. I didn’t know that that was common in Greece although it really makes sense for a bigger port like this. I got permission to stay on the central pier. You can’t go closer to a taverna with your boat! 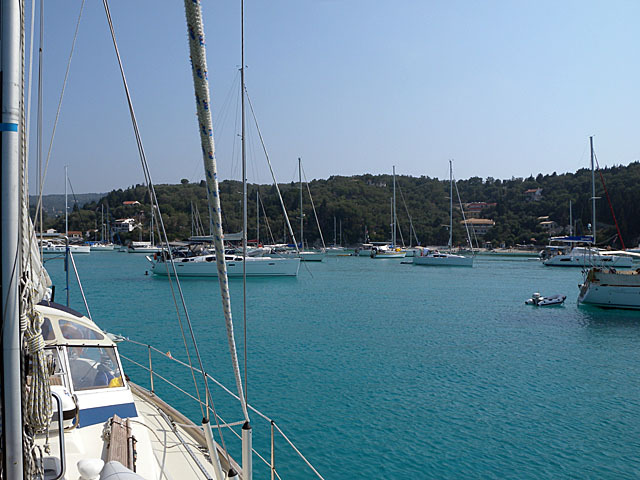 I left at about 09:30 for the first single handed trip to Paxoi. 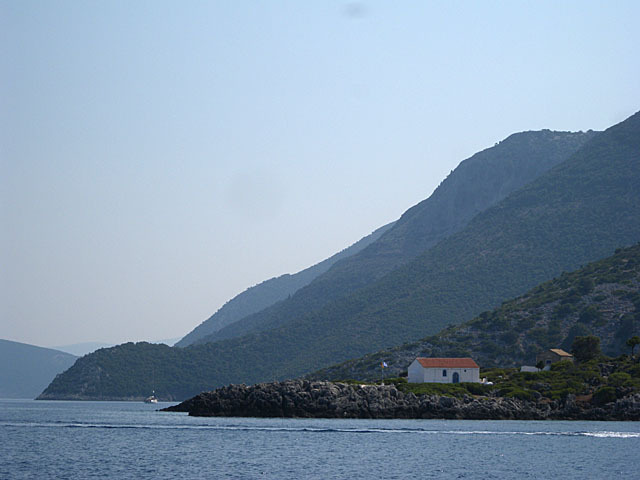 Most of the trip was motoring but some sailing was possible the last two hours before arrival in Ormos Lakka. 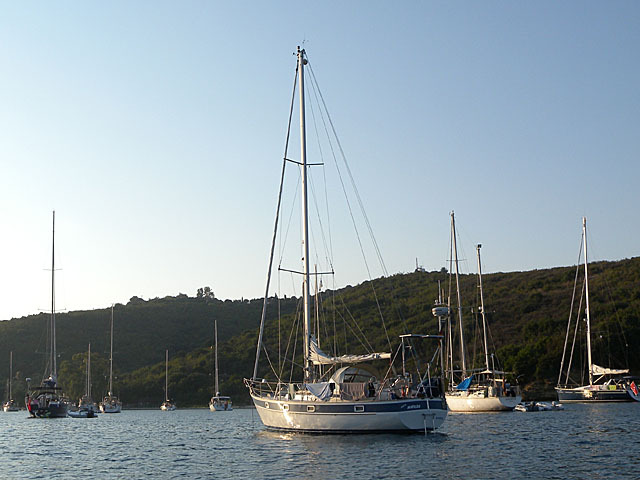 This bay is beautiful with turquoise water and an ideal anchor ground. Since that is not a secret, there were about 50 boats already anchoring in the bay when I arrived at 16:00. Fortunately, there is enough room and the ground is clear. 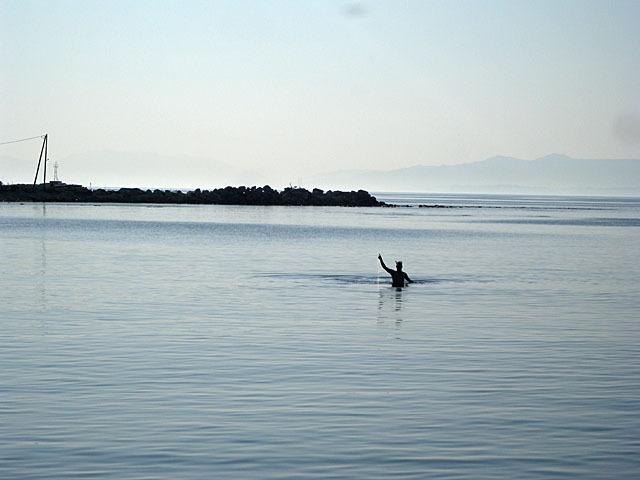 Consequently, it was easy to find a good place to anchor. 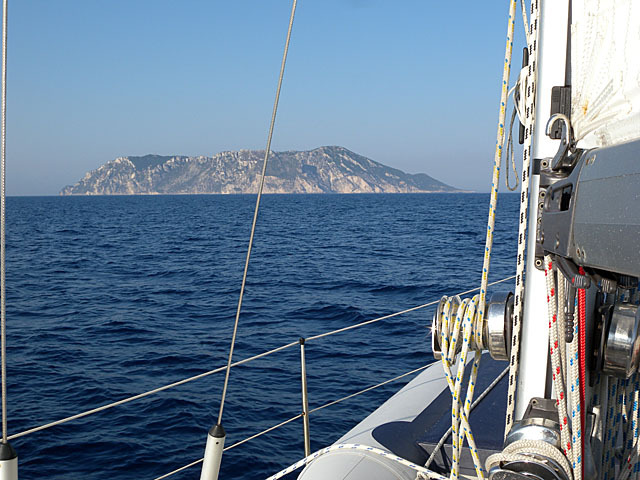 On Tuesday the 16th at 10:30 we left St Maria di Leuca and headed east to Othonoi. 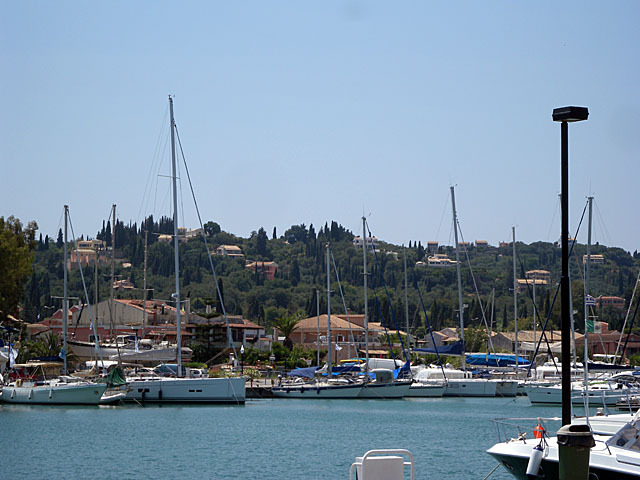 Othonoi is the biggest of three islands north-west of Corfu and is often used for a night stop by yachts transiting from Italy to Greece and vice versa. So did we. We arrived late in the afternoon and tried to anchor. There were already quite a number of yachts anchoring in the bay and we had to go for a somewhat remoter place further off in the east side of the bay. After a while of trying, the anchor seemed to have set and we switched off the engine. 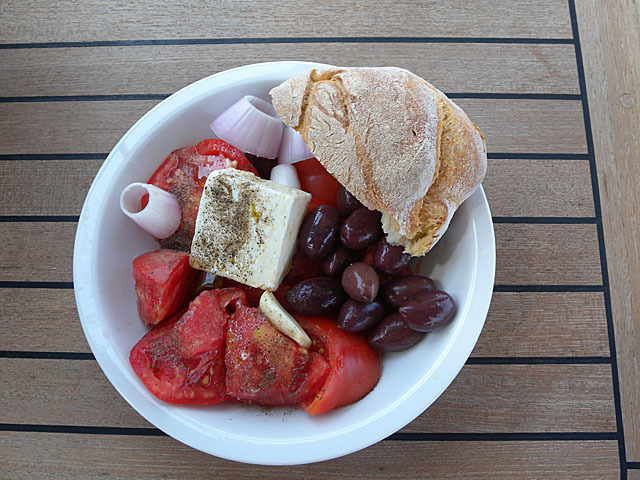 There were strong gusts blowing into the bay from the 480m high mountain of the island and I did not dare leaving the boat alone and go for my Greek salad, tzaziki and local whine a have been waiting for all along the passage. 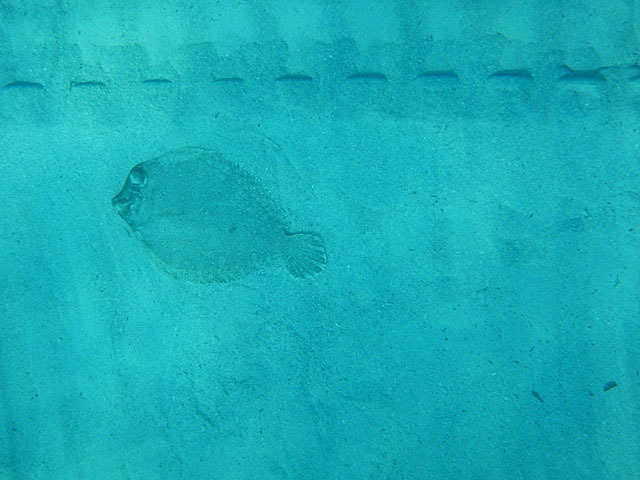 I got my flippers on and the mask and had a look at the anchor which was lying in about 10 m depth. The bottom was covered with big stones, rocks and plates and the anchor was holding just with its tip in a crack of one of the plates. That was not good. We decided to move the boat into the little bay where the anchor ground was sand. We tried a few times and finally the anchor seemed to hold but after a while we observed that the boat had moved astern about 5 meters. Unfortunately, there was not much space left astern and the gusts were still falling into the bay. This location was even worse. 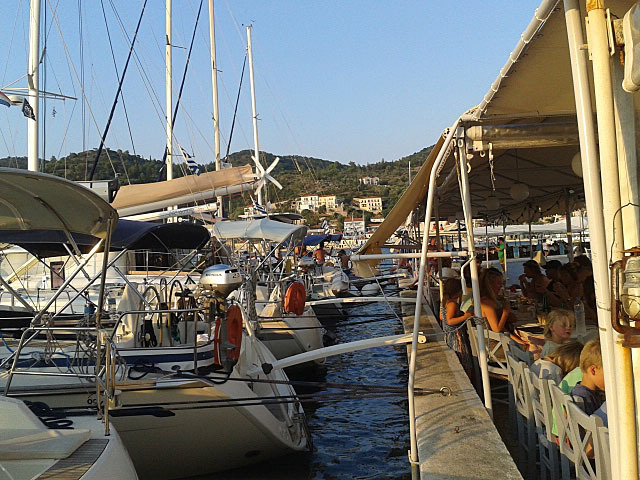 Not only couldn’t we leave the boat but we could watch the guests now sitting in the tavernas and even smell the food. We had to find a solution! We decided to go out again. The sun had already disappeared behind the mountain and it was getting dark. We found a place over that rocky bottom again. It was about 10:00 now and the gusts had weakened significantly. We left the boat and went for a Greek dinner. The dish of the day was stuffed tomatoes and peppers. Tzatziki and saganaki as starters and a Greek salad were added. Jummy! Yes! I am in Greece! The owner of the taverna has a boat too and he said that there were big rocks just 1 meter below the waterline not far away from where we anchored. I had a look around the boat the next morning and saw a massive rock just 5 boatlengths away which was not shown in the harbour map. I was really glad we didn’t hit it whilst looking for the place to drop the anchor last evening. That rock is not really far away. I am glad we did not hit it last night! 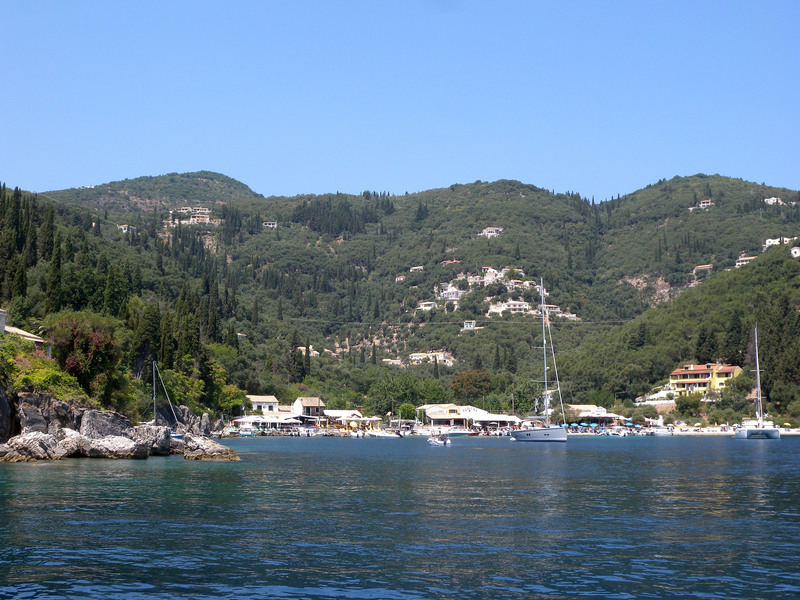 Next stop on Friday the 17th was the little bay of Agios Stefenos. This one was really tight and we had to anchor a bit further off at the entrance of the bay. Although thick weed, we got the anchor in first time and holding was good. 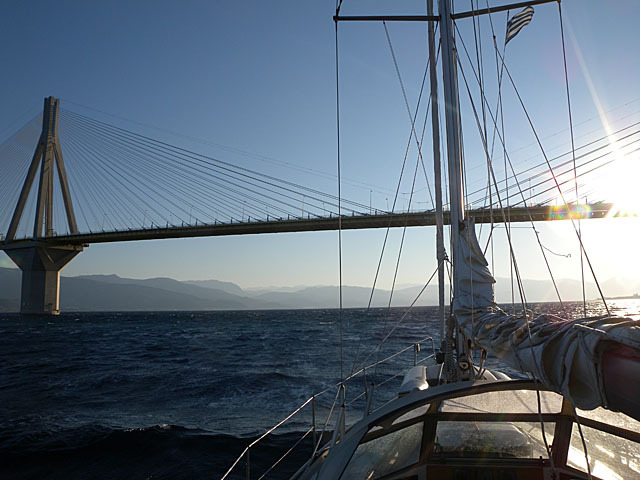 The final Leg will be sailed singlehanded from Gouvia Marina to Oropos. Although I will spend most nights at anchor I will try to keep this blog up to date. So stay tuned and see you soon! Next Stop Greece… Lets go! Le Castella to Crotone yesterday, Crotone to St Maria di Leuca today. The trip yesterday was only about 20NM but since it was beating to windward at F4 – F5, it took a while. We arrived in Crotone at 18:00. The trip to St Maria di Leuca today was longer. 75NM. 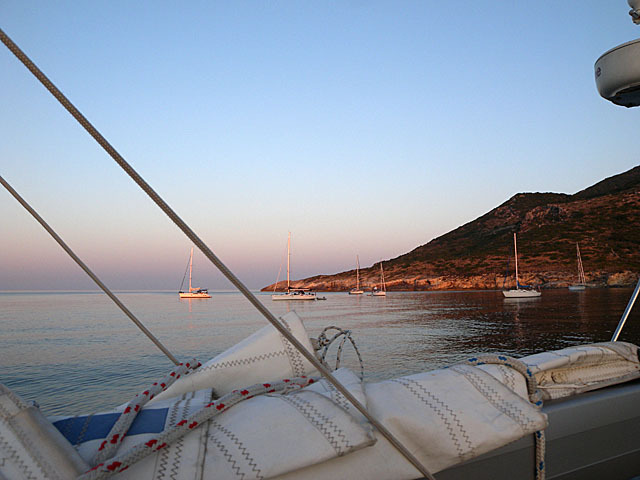 We had to start early in the morning (06:30) in order to arrive before 20:00 and get a chance to look for a replacement bottle of Campingaz before we leave for Othonoi and Ereikoussa, the two first little islands in Greece where we will drop anchor. 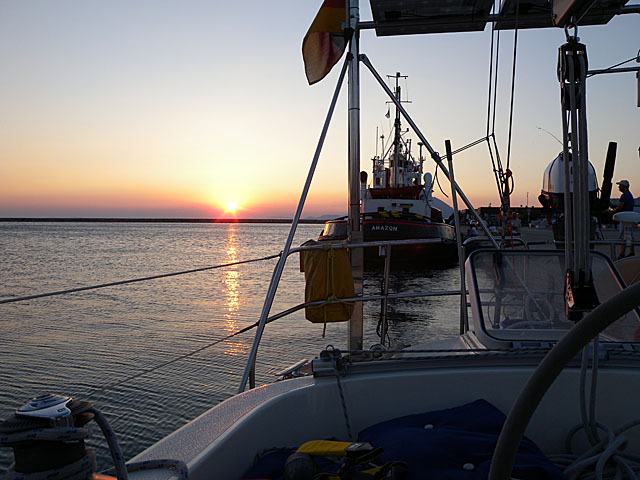 When we left, just at the entrance of the harbour where the depth was supposed to be 3+ meters, the boat suddenly stopped. We had run aground on sand. The harbour had silted up at the north side of the entrance. With some effort I managed to turn the boat 90 degrees facing to deeper water and finally got free again. Lesson for today: NEVER trust harbour plans! Most of the sailing today was close hauled at F4 to F5. With the main and the genoa hoisted, we had a bit too much sail up from time to time and the bulwark was often under water. We were constantly making more than 6 knots through the water which is quite good for that point of sail. Then I saw some water sloshing above the floor at the walk through to the front cabin and thought “oh… not again!” I tasted and it was salt water. I checked the bilge… it was dry (uffff….). It wasn’t much fortunately but it was salt water. Where was that coming in again? I wiped up the salty water and dried the area in order to check where it was coming from. It was the anchor locker. There is a leakage and we were taking in about 500ml per hour. There was always some water coming in there depending on the point of sail but it has never been that much. Anyway, this is another thing I would have to check after arrival at my final destination but fortunately, this does not present any safety issue.